Puppy School is delighted to be supported by Natures Menu, who have been creating 100% real, wholesome food for pets for over 35 years. Our relationship with our sponsors Natures Menu means that we can offer a range of benefits to our clients joining our puppy classes. Following booking onto classes, you will shortly receive a Nature’s Menu Puppy box delivered to your door completely FREE of charge. 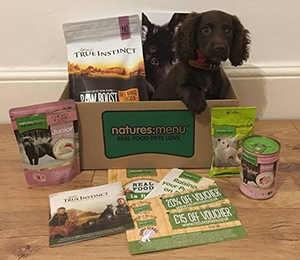 Your free Natures Menu Puppy box is worth over £35.00. This generous offer from Natures Menu allows you to sample lots of products so that you’ll be able to discover the great range of natural products available to your puppy. 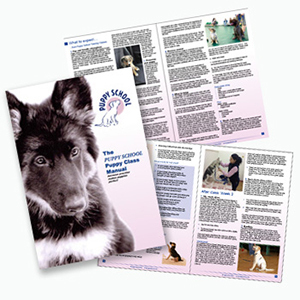 1 x Puppy School Manual. This will tell you what to expect from our classes as well as giving extra information on training and what to practise after each class. Natures Menu offers a range of products to help your puppy to start off on the right paw. Their food ranges, made with naturally wholesome ingredients, are gentle on the stomach and easily digested by your growing puppy. To find out more about feeding your puppy the natural way, visit www.naturesmenu.co.uk or ask your Puppy School tutor for more information.